In the previous release, we proudly reported the initial use of Genode as day-to-day OS. With the current release, we maintained the strong focus on making Genode viable as the foundation of a desktop OS. There are many aspects to be considered, ranging from configuration concepts, over the GUI and audio architectures, to device-driver support. Section Genode as desktop OS gives insights into this development and our train of thoughts. Speaking of device drivers, the current release comes with the Intel KMS driver ported from the Linux kernel and running as a user-level component. The driver allows us to drive multiple displays and change screen resolutions on the fly. Since the driver code relies on the Intel GEM infrastructure of the Linux kernel, we had to port those subsystems as well. So the new driver could be taken as starting point for a user-level GPU multiplexer in the future. In addition to those prominent features, the release comes with numerous improvements and additions. For example, we enhanced the support for the USB Armory (a dedicated article about this work will follow soon), added support for Xilinx Zynq-7000, and optimized our version of VirtualBox for NOVA. According to our road map, we planned to address package management, a modern web browser, and cross-kernel binary compatibility with the version 15.11. However, we decided to put emphasis on the general usability, robustness, and scalability first, before entering new developments. So those topics are not covered by the current release. That said, package management is a topic of ongoing active development within our community. Most of the file-system improvements featured in the current version were motivated by this line of work. Where do we stand with the use of Genode as desktop OS? Currently, there is a hand full of people using Genode as day-to-day OS. By eating our own dog food, we are able to recognize and remedy all the little issues that stand in our way. Hence, the user experience is steadily evolving. Still, at the current stage, it is not palatable for end users with no background in the development with Genode. For installing a Genode-based desktop OS, one has to compile and configure all components from source, there is no package management, there are no wizards that guide you, and there are no GUI dialogs for configuring the system. However, all the pieces for creating a system that is practically usable are available, and putting them together is a lot of fun! The overall theme of the current release is the use of Genode as a desktop operating system. 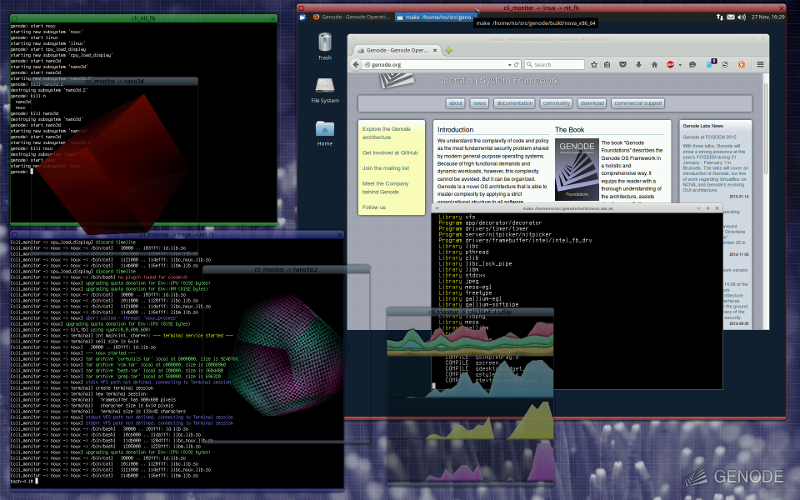 The state of development is best expressed by the screenshot of the Genode/NOVA-based setup used by Norman on his x201 Thinkpad. Under the hood, the new Intel KMS driver (Section Intel-KMS framebuffer driver) drives the external 1920x1200 display in addition to the internal LCD display of the laptop. The wireless network has just been configured via the noux session located at the bottom left facilitating the configuration concept explained in Section Uniform run-time configuration concept. The windows are decorated with a new window decorator that supports drop shadows and translucent decorations. The decorator can be tweaked and even replaced at runtime. How to pass parameters to applications when they are started? Whereas the common approach of argc-argv-based command-line arguments is nice for the interactive use at a shell, it does not scale well: Structured information is hard to express and the syntax varies from application to application. Where are configurations stored and how do applications obtain them? Traditionally, programs obtain their configuration data from well-known locations at the file system like the /etc/ directory or dot files in the home directory. On Genode, however, there is no common file system structure and the notion of a home directory does not even exist. Alternatively, configuration data could be stored at a central "registry" service. But such a database-like mechanism is less transparent to the user and creates a bunch of new problems with respect to management and access control. Furthermore, the impact of such a nontrivial central component on the system's trusted computing base cannot be neglected. Is it possible to cover the configuration needs of low-level components like device drivers and file systems with the same mechanism as used by high-level applications? How can the configuration of a long-living component be tweaked at runtime without the need to restart it? We attempted to answer these questions with a single mechanism in version 12.05. But the scalability of the approach remained unproven until now. In short, configuration information is supplied to a component by its immediate parent component in the form of a ROM session with the name "config". A ROM session represents a piece of data (ROM module) that can be made visible in the component's address space. Furthermore, the ROM session allows the component to register a signal handler that is notified should a new version of the ROM module become available. The component can - at its discretion - respond to such a signal by requesting the new version. Consequently, a ROM session is a way to transfer information from the ROM server to the ROM client in a transactional manner. When used as configuration mechanism, the server is the parent and the client is the child component. From the child's perspective, it is irrelevant where the information comes from. The parent could have read it from a file system, or obtained it from another ROM service, or could have generated it. By convention, configuration data has an XML-like syntax, which allows us to express arbitrarily structured information. The figure above illustrates an example scenario. The backdrop component obtains a description of the background composition as its "config" ROM module. 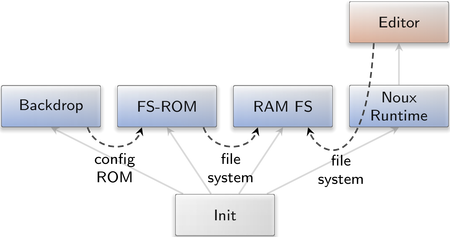 The init component routes this ROM-session request to the FS-ROM server, which provides a ROM service by reading the content of ROM modules from a file system. The same file system can, of course, also be accessed by other clients. At the right side, a noux instance executes an editor like Vim to edit files in the file system. Each time, the file is saved by the editor, FS-ROM gets notified, which, in turn, notifies the backdrop to update its configuration. This way, a desktop background can be interactively changed using Vim. With the current release, we have incorporated the ability to dynamically respond to configuration changes into many components to make them ready for the use in a desktop environment. To illustrate the flexibility of the mechanism, we can perform the following operations by merely editing text files as explained in the backdrop example above. Letting our new Intel KMS driver (Section Intel-KMS framebuffer driver) change screen resolutions or enable/disable connectors. Changing the volume of audio channels per application or the master volume. Changing the colors, style, and the placement of window controls of the window system. Changing the policy of the nitpicker GUI server such as the tinting of screen regions depending on the labels of the visible applications. Connecting to a wireless network by editing the configuration of the Intel wireless driver. Replacing an entire subsystem by a new one by replacing the configuration of a nested instance of the init component. Assigning a USB device to a subsystem by editing the USB driver's configuration. Configurations can be annotated with comments, managed via a revision-control system like Git, and compared to older versions via diff tools. Because the mechanism is based on a textual representation, accessibility of all configuration-related operations is built-in into Genode by default. The response of components to configuration changes can be subjected to automated tests, which merely need to present varying ROM modules to components (as done by the dynamic_rom server). Combined with the report-session facility that allows components to report state to its parent, the configuration concept makes the creation of graphical front ends a straight forward experience. For example, a hypothetical display-settings dialog would obtain the framebuffer driver's report about the available connectors and supported resolutions, present a dialog of options, and, in turn, generate new configurations for the framebuffer driver. If a new display gets connected, the driver would update its report, triggering the dialog to present the new options. Section Audio stack presents a similar scenario for mixing audio. Since the first release in 2008, Genode is equipped with a GUI server called nitpicker, which plays the role of a secure "hypervisor for graphics". With less than 2000 lines of code, it multiplexes the framebuffer and routes input events in a secure way. Its low complexity stems from the fact that it does contain almost no policy. In particular, it has no notion of "windows" or similar common GUI elements. These parts of the GUI must be implemented at the client side. In version 14.08, we laid the foundation for a scalable GUI architecture that further reduced the functional scope of nitpicker and complements nitpicker with higher-level components for managing windows. Thanks to this architecture, most of nitpicker's formerly built-in policies such as the pointer shape could be moved to separate components that are easy to replace and customize. We were ultimately able to incorporate the notion of windows into the architecture without introducing a new interface. Instead, the window manager implements the same interface as the nitpicker GUI server. Applications are unaware whether they talk to nitpicker or the window manager. Both nitpicker and the window manager provide the same (nitpicker session) interface. With the current release, we push this architecture even further. By eliminating the notion of the X-ray mode from nitpicker as explained in Section Rigid separation of policy and mechanism, we further reduce nitpicker's responsibilities and greatly improve its flexibility. We managed to completely decouple the components for painting window decorations and managing window layouts from the window manager to the point where we can dynamically replace those components at runtime. Furthermore, we introduce a new window decorator (Section Enhanced window-decorator and window-layouter flexibility) that can be styled in a very easy way. Nitpicker's X-ray mode is a distinctive feature of the GUI server. It allows the user to reveal the identity of applications by pushing a special button at any time. The following picture shows the effect. In contrast to the original version of nitpicker, the new GUI stack allows the window decorator to properly respond to X-ray mode changes. Whereas nitpicker is responsible for tinting the window content and painting the client's labels as a watermark, the window decorator applies the color change to the window decorations. Normal (left) and X-ray mode (right). While X-ray mode is enabled, the user is able to validate the authenticity of the presented applications and thereby uncover Trojan Horses. Interplay of the nitpicker GUI server with externalized policy components. The X-ray trigger component is a nitpicker client that receives certain global key sequences according to nitpicker's configuration. It is thereby able to exclusively respond to the X-ray key. Furthermore, it is able to incorporate any number of other conditions to decide whether to enable or disable the X-ray mode. For example, by making nitpicker's hover reports available to the X-ray trigger, X-ray could be automatically enabled while the pointer hovers over a panel or the window decorations. The X-ray trigger, in turn, reports its decision via an "xray" report. This report is routed as input to the ROM filter. The ROM filter responds by generating a new configuration for nitpicker. In addition to the flexibility of making X-ray trigger policy and the actual X-ray effect easily customizable, the new approach allows other components outside of nitpicker to respond to the X-ray mode, most particularly the window decorator. The window manager merely acts as a low-complexity mediator of potentially complex and policy-rich components like the window decorator and the window layouter. Both the decorator and the layouter are mere clients of the window manager. 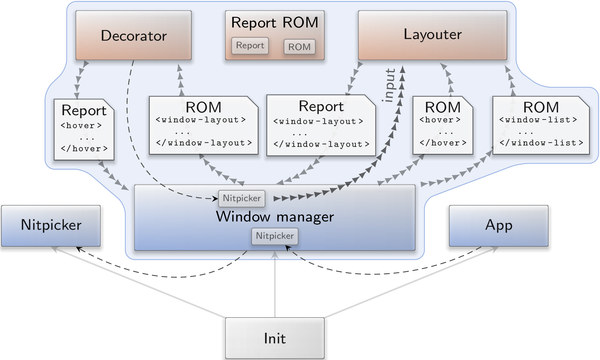 Window-related information is exchanged between these components via the report-ROM component, which provides a publisher-subscriber mechanism by implementing Genode's report and ROM session interfaces. Because state information is always kept at the report-ROM server outside the decorator and the layouter, it is possible to replace those components at runtime without losing any information about the state of the present windows. The following screenshot shows how the classical window decorator gets replaced by the new themed window decorator introduced in the next section. We added support for the common window controls close and maximize to the window layouter and decorator. The order of those controls in the window title can be configured, and can even be changed at runtime. When activating the window closer, the window manager sends a resize request for the size 0x0 to the corresponding client. It is up to the client to implement a meaningful response such as exiting the application. Thanks to the separation of the X-ray policy from nitpicker as explained in Section Rigid separation of policy and mechanism, components other than nitpicker have become able to respond to the X-ray mode. This is particularly useful for the window decorator, which can now take the X-ray mode into account for tinting window decorations according to the session colors. We enhanced the existing window decorator by a configurable assignment of colors for different windows depending on the window labels. Similar to nitpicker, the decorator is able to respond to configuration updates at runtime. 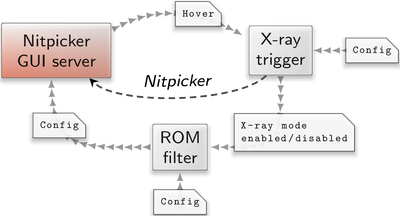 Even though the decorator has no notion of an X-ray mode, it can respond to the X-ray mode when combined with a ROM filter, analogously to the configuration depicted for nitpicker in Figure 5. We created a second decorator to illustrate the versatility of the GUI architecture, and to give users a modern-looking alternative to the original Motif-inspired decorator. The new themed decorator is located at gems/src/app/themed_decorator/. In contrast to the original decorator that has a built-in style, the new decorator obtains the style information from a few PNG images, a font, and a bit of metadata. Those files need to be mounted into the VFS of the decorator at the /theme/ directory. The following Figure 8 shows the three images default.png, closer.png, and maximizer.png of the default theme. The <aura> node contains the margins for the area around the decorations, which gives us room for drop shadows. The <decor> node contains the margins of the actual decorations. The <title>, <closer>, and <maximizer> nodes contain the positions of the corresponding window controls with the coordinates referring to the coordinates in the default.png image. While working on the audio stack and improving the support for audio applications in VirtualBox, we took the chance to modernize the mixer component and applied Genode's dynamic configuration concept to the mixer. muted marks the channel as muted. In addition, there are optional read-only channel attributes, which are mainly used by the channel-list report. Each channel node features all mandatory attributes as well as a few optional ones. The name attribute contains the name of the channel. It is the alphanumeric description of the numeric number attribute. The active attribute indicates whether a channel is currently playing or not. A channel-list report may be used to create a new configuration for the mixer. Each time the available channels change, e.g., when a new client appears, a new report is generated by the mixer. This report can then be used to configure the volume level of the new client. A new report is also generated after a new configuration has been applied to the mixer. Thereby, a mixer agent becomes able to adapt itself to recent changes. As an example, there is an experimental mixer agent based on Qt5 repos/gems/src/app/mixer_gui_qt that processes the mixer generated channel-list reports. It takes the report and writes a new configuration to the file mixer.config that can then be used by the mixer. Interplay of the graphical mixer front end (mixer agent) with the audio mixer. This scenario is available in the form of the run script at gems/run/mixer_gui_qt_test.run. In addition to the mixer and mixer agent, it features a few more components. We therefore also discuss their roles here. 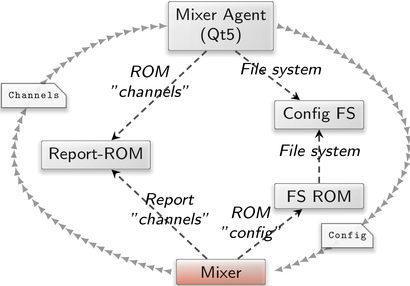 The mixer component receives its configuration from the FS-ROM component and reports a list of its channels to the report-ROM component. The mixer agent accesses the channel-list report as ROM module provided by the report-ROM component. It writes the configuration to the file /config/mixer.config, which is stored by the config-file-system component. The FS-ROM component exports each file as ROM module. One of those modules is the mixer.config that is, in turn, presented as configuration to the mixer component. Each time the mixer.config file is altered, the mixer receives a signal, reloads the new version of the configuration, and adapts itself accordingly. In return, the mixer sends a new report every time its channel list changes. This report is consumed by the mixer agent to adjust itself, i.e., to display or remove a client widget. All this mechanics is hidden behind a simple GUI dialog. By moving a slider, the user generates a new mixer configuration. When using Genode as a desktop OS, users need to be able to copy and paste text between different subsystems such as guest OSes running in VirtualBox and Qt5 applications running directly on Genode. This integration feature requires two ingredients. First, the respective subsystems need to interface their internal clipboard mechanisms (like the clipboard of the guest OS) with the Genode world. Second, we need a clipboard component that manages the information flows between the subsystems. A subsystem propagates new clipboard content to the Genode world via a report session with the label "clipboard". Each time its internal clipboard content changes, it issues a report with the new content. For importing clipboard content from the Genode world, the subsystem opens a ROM session with the label "clipboard" and registers a signal handler for ROM-changed signals. Upon the reception of such a signal, the subsystem requests the updated ROM content and forwards it to its internal clipboard. The session labels for the ROM and report sessions are merely a convention that should be followed to enable the session routing in a uniform way. The clipboard component is similar to the existing report-ROM server in that it provides both a report service and a ROM service. In contrast to the report-ROM server, however, all report sessions refer to the same (clipboard) report. Reports by different clients override each other. Each time the report changes, all ROM clients are notified, which can respond to the notification by requesting the updated version of their clipboard ROM module. This example defines a policy where data can flow from the work and hobby domains to the admin domain but not in the other direction. Furthermore, data copied in the hobby domain can be pasted in the work domain but not vice versa. The clipboard server accepts reports only when they originate from the domain that is focused by nitpicker. Nitpicker already provides "focus" reports that contain this information. Conveniently, the focus reports already contain the name of the focused domain (in addition to the client's session label). With the correspondence of the clipboard's domains to nitpicker's domains, the clipboard is able to take nitpicker's focus reports into account for the information-flow policy. To further limit the rate of artificial clipboard reports, the clipboard component accepts reports only from a domain where a corresponding nitpicker client received user input recently. The term "recently" refers to a reasonable upper bound of the time needed by a guest OS or an application to respond to Control-C or a similar key sequence, i.e., 500 milliseconds. This way, a subsystem can submit new clipboard content only shortly after the user interacted with the subsystem, which is always the case when the user triggers the copy operation. To accommodate this mechanism, nitpicker's focus reports had to be slightly enhanced by a new attribute "active" that is set to "yes" if the user interacted with the domain recently. As another measure to limit the bandwidth of the covert channel, the clipboard server notifies its ROM clients only if their ROM module actually changed. This way, not each report from an unrelated domain results in a ROM-changed signal but only the one that invalidated the formerly visible clipboard content. So the active help of the user is required to transfer bits of information. With the current release, the clipboard protocol has been implemented into Qt5 applications and VirtualBox. On VirtualBox, we leverage the shared clipboard mechanism provided by the VirtualBox guest additions. In dynamic scenarios like desktop computing, subsystems should be able to gracefully exit. For applications manually started via a panel or a shell-like command interface (CLI monitor), the user expects the system to free the application's resources after the exit of the application. Originally most of Genode's runtime environments used to respond to the exit of a child by merely printing a message to the log. It was up to the user to manually regain the resources by explicitly killing the subsystem afterwards. To make the CLI monitor and the graphical launcher more pleasant to use, we enhanced them to perform the kill operation automatically once a child exits gracefully. If the propagate attribute is set to yes, the exit of the respective child will result in the exit of the entire init component, including all siblings of the exited component. The approach gives us the freedom to define even multiple children that may trigger the exit condition of init (by specifying an <exit> node at several <start> nodes. Access-control policies in Genode systems are based on session labels. When a server receives a new session request, the session label is passed along with the request. A session label is a string that is assembled by the components that are involved with routing the session request from the client along the branches of the component tree to the server. The client may specify the least significant part of the label by itself. This part gives the parent a hint for routing the request. For example, a client may create two file-system sessions, one labeled with "home" and one labeled with "bin". The parent may take this information into account and route the individual requests to different file-system servers. The label is successively superseded (prefixed) by additional parts along the chain of components on the route of the session request. The first part of the label is the most significant part as it is imposed by the component in the intermediate proximity of the server. The last part is the least trusted part of the label because it originated from the client. Once the session request arrives at the server, the server takes the session label as the key to select a server-side policy. Whereas the use of session labels for selecting server-side policies has been a common practice for a long time, label-dependent session routing was rarely needed. In most cases, routing decisions were simply based on the type of the requested sessions. However, as Genode's system scenarios get more sophisticated, label-dependent routing becomes increasingly important. As we wished to express the criterion of routing decisions and the server-side policy selection in a uniform way, we introduced the following common label-matching rules. The session label must perfectly match the specified string. The first part of the label must match the specified string. The last part of the label must match the specified string. If no attributes are present, the route/policy matches. The attributes can be combined. If any of the specified attributes mismatch, the route/policy is neglected. If multiple <service> nodes match in init's routing configuration, the first matching rule is taken. So the order of the nodes is important. If multiple <policy> nodes match at the server side, the most specific policy is selected. Exact matches are considered as most specific, prefixes as less specific, and suffixes as least specific. If multiple prefixes or suffixes match, the longest is considered as the most specific. Note This change requires slight adaptations of existing configurations because the semantics of the original label attribute of server-side policy nodes has changed. Originally, the attribute value was taken as a prefix for matching the session label. Now, the attribute would be taken as a perfect match. The adaptation of existing configurations is as simple as replacing "label" by "label_prefix". Since the change tightens the semantics of the label attribute, it will not weaken the security of existing policies. In the worst case, a server will reject sessions that formerly passed the label checks, but not vice versa. Genode has traditionally featured a number of file system servers, each designed for a specific storage back end. The implementation of new servers and features came with the additional effort of maintaining consistent code and behavior between server varieties. The VFS server is a solution to this redundancy. By building a server around the VFS library, new storage back ends need to implement the VFS plugin interface only. This unification is not without runtime benefit, as it leads the way to more discretion in component composition. The server allows clients to share the burden of plug-ins that come with a large consumption of resources, but this potentially reduces privacy and can act as covert communication medium. From another perspective, clients may host plug-ins to reduce context switches between the file system and raw storage, or the VFS server may host high complexity plug-ins to maintain low complexity in a security sensitive address space. For the time being, the VFS server should be considered a resource multiplexer without strong client isolation. The following two configurations contrast the traditional ram_fs with the VFS server. A goal of the VFS library is to provide declarative file system composition. This release adds a symlink built-in to the library, which allows the configuration to populate file systems with symlinks. The fs_log component has been refactored to better express the source of logging streams as well as to operate at lower complexity. For each client session, the session label is converted to a directory tree with the trailing element being the file, to which log messages are written. Logs may also be merged using session-policy selectors with a label prefix. See os/src/server/fs_log/README for details. The new ROM logger component located at os/src/app/rom_logger/ is a simple utility to monitor the content of a ROM module. It is meant to be used for test automation and during debugging. Each time, the monitored ROM module changes, the ROM logger prints its content to the LOG. The new ROM filter component located at os/src/server/rom_filter/ provides a ROM module that depends on the content of other ROM modules. Its designated use is the dynamic switching between configuration variants dependent on the state of the system. For example, the configuration of the window decorator may be toggled depending on whether nitpicker's X-ray mode is active or not. The configuration consists of two parts. The first part is the declaration of input values that are taken into account. The input values are obtained from ROM modules that contain XML-formatted data. Each input value is represented by an <input> node with a unique name attribute. The rom attribute specifies the ROM module to take the input from. If not specified, the value of name is used as the ROM name. The type of the top-level XML node can be specified via the node attribute. If not present, the top-level XML node is expected to correspond to the name attribute. Contains content to be written to the output. Produces output depending on a condition (see below). If the condition is satisfied, the <then> sub node is evaluated. Otherwise, the <else> sub node is evaluated. Each of those sub nodes can contain the same nodes as the <output> node. The <has_value> condition compares an input value (specified as input attribute) with a predefined value (specified as value attribute). The condition is satisfied if both values are equal. For an example that illustrates the use of the component, please refer to the os/run/rom_filter.run script. By broadening the diversity of hardware and kernels that Genode supports, the file structure of some subdirectories of the source tree became increasingly confusing. Although our build system already provides a mechanism - the so called spec values - to choose between different aspects like kernels or devices, source codes depending on certain spec values were not always easily recognizable as such. Moreover, some of the spec values used the prefix "platform", or were grouped in "platform" subdirectories, others did not use that term. Thereby, the semantics of "platform" became more and more blurry over the years, describing either a board, processor architecture, SoC, or kernel-hardware amalgam. Automatically added include paths of sub-repositories, which are dependent on spec values and which formerly resided in repos/*/include/platform/, were moved to repos/*/spec/. Library descriptions that depend on spec values now reside in repos/*/lib/mk/spec/. The "platform" names mainly vanished from the source tree. It is strongly recommended to clean-up older build directories completely before compiling the new release because of the significant changes of the directory structure. The new overloads of the ascii_to function for bool and uint64_t allow the easy extraction of such values from XML nodes and session-argument strings. The introduction of the clipboard component called for a way to embed and extract data (like clipboard content) from untrusted sources into an XML node without breaking the XML structure. The embedding of such data is accommodated by the new append_sanitized method of the Xml_generator. For the extraction of such data from XML nodes, we added corresponding accessor methods (decoded_content) to the Xml_node. The utilities provided by os/session_policy.h used to be tailored for the matching of session arguments against a server-side policy configuration. However, the policy-matching part is useful in other situations, too. Hence, we removed the tight coupling with the session-argument parsing (via Arg_string) and the hard-wired use of Genode::config(). To make the utilities more versatile, the Session_label has become a Genode::String (at the time when we originally introduced the Session_label, there was no Genode::String). The parsing of session arguments is performed by the constructor of this special String. The constructor of Session_policy now takes a Genode::String as argument. So it can be used with the Session_label but also with other String types. Furthermore, the implicit use of Genode::config() can be overridden by explicitly specifying the compound XML node as an argument. The common problem of scoring XML nodes against a given label, label prefix, and label suffix as explained in Section Label-dependent session routing is addressed by the new Xml_node_label_score utility. It is used by the init component to take routing decisions and by servers to select policies dependent on session labels. The file system APIs received a few simple amendments. New error codes were added to broaden error handling, and session arguments were added to the file-system service. File-system session requests now carry a writeable and root argument. The latter enables clients to request a root offset when connecting to the service that is appended to the root policy of the server. The writeable argument gives the client a way to express its intention to never write. If writeable is set to true, the ability to perform write operations can still be overridden by a server-side policy. The object pool is one of the eldest abstractions in Genode. It is in particular used for thread-safe RPC-object lookup. However, with the increasing number of requirements over the years, its API and semantics became difficult to understand. Moreover, the synchronization primitives had to be handled by the user of the interface appropriately. So it was possible to access an object without holding its lock. We observed some corner cases where the object pool's insufficiencies led to inconsistencies within the RPC server framework. Therefore, we decided to rework the object pool's API and implementation. The functor that is provided must have one argument, which is a pointer to the expected object's type. The object pool implementation will search for the object with the designated capability and will dynamically cast it to the type given by the functor. If the object could not be found, or if the cast fails, the functor gets called with a null-pointer as argument. Thereby, the user is able to handle mismatches explicitly. Caution has still to be taken when destroying objects. Deleting an object during a look-up leads to a deadlock situation. As the object pool will unlock an object again after applying the functor to it, the object must not be deleted in the scope of the functor. Users of the object pool should use the apply function to remove an object from the pool instead, and afterwards delete it. To raise the convenience here, we will possibly enrich the object pool's API in one of the upcoming releases by appropriated factory/deletion methods so that the entire object's lifetime is handled safely via the object pool. On some hardware platforms, memory-mapped registers of different devices happen to be co-located at the same physical memory page. Since memory-mapped I/O resource can be handed out to drivers at the granularity of 4K pages only, drivers had to deal with sub-page register offsets as special cases. To remove this burden from the driver developers, the Attached_io_mem_dataspace has been changed to accept physical addresses at byte granularity and hands out the corresponding virtual addresses including the sub-page offset transparently for the driver. We enhanced our version of Qt5 with the support for key repeat and the ability to use the new clipboard mechanism presented in Section Copy and paste. Clipboard support must be explicitly enabled by setting the attribute clipboard in the application's <config> to "yes". We changed the allocation of guest VM memory from a few large contiguous memory dataspaces to more and smaller dataspaces. The change enables us to start VMs even if there is no contiguous memory chunk available for a VM. Additionally, we implemented the detection of VM shutdowns. If the VM finally powers off, our Virtualbox virtual-machine monitor (VMM) notifies its parent via the exit operation of the parent interface. The parent may respond to such a signal, e.g., by destructing the entire VMM subsystem including the virtual machine. In order to exchange clipboard data of a guest OS with Genode, we enabled the VirtualBox guest-addition support to receive and transfer clipboard data. Depending on the configured clipboard mode in the .vbox file of the VM, clipboard data may get exchanged - bidirectional, host-to-guest only, or guest-to-host only. In the bidirectional and host-to-guest cases, a dataspace with the name "clipboard" will be requested and evaluated each time the content changes. In the bidirectional and guest-to-host cases, the VMM acts as Genode ROM reporter. While debugging load problems within VirtualBox, we observed that a running Windows 8 guest VM did generate a lot of VM exits by using the rdtsc instruction at a high rate. Since this instruction traps into the VMM, it can impose a huge load in the VMM that - amongst other - severely influences audio playback/recording (e.g., distorted sounds and the like). As an interim solution, we have disabled the virtualization of the rdtsc instruction completely. This works well as long as each guest VM runs on its own CPU core. However, when sharing one CPU by multiple VMs, time-stamp-counter (TSC) warping occurs. Building a more robust solution regarding TSC warping and drifting requires further evaluations, which we will conduct in the future. When using VirtualBox with the window manager, clicking the window-close button initiates an ACPI shutdown of the VM, which allows the guest operating system to quit safely. VirtualBox can now run 64-bit guest operating systems. For Windows guests, only one guest CPU is supported at the moment. In the context of using Genode as a desktop OS, we extended our Seoul VMM port to be able to start lightweight VMs for specific use-cases, such as web-browsing, more easily. One step into this direction was to enable, extend, and stress test the AHCI and IDE disk-device models of Seoul. Based on our improvements, we were able to come up with a user-friendly reproducible work-flow to setup customized Tinycore VMs. With the current release, we proudly present a port of the Intel i915 driver from Linux kernel 3.14.5 to Genode. We successfully tested it on machines containing Intel GPUs from generation five up to generation eight. With the port of the Intel driver to Genode, we followed the approach that we already used to enable the USB stack on Genode described in release 12.05, to enable the Linux TCP/IP stack in release 13.11, and more recently to enable the Intel wireless stack in release 14.11. The driver adapts to every change of its configuration immediately. Thereby users can enable or disable display devices, or change their resolution by simply editing the configuration file of the driver at run time. The existing framebuffer driver for the Samsung Exynos 5 SoC has been generalized to also cover the Exynos 4 SoC, specifically the ODROID-x2 platform. Thanks to Alexy Gallardo Segura for this contribution. Up to now Genode's AHCI driver supported hard disks that offered the native command queuing feature (NCQ) only. While NCQ vastly improves the performance of a hard disk, some drives simply do not support this feature. Therefore, we extended the AHCI driver and enabled NCQ detection during device initialization. If a device does not support NCQ, the driver programs the controller accordingly during block requests. As an artefact from our initial porting effort, the WLAN driver used a device white list because it would scan the PCI bus in a suboptimal way. To reduce the time it takes to iterate over all possible matches in the driver's ID table, we reduced the list to only those few devices we explicitly wished to support. With this release we finally addressed this issue and got rid of the device white list. The driver is now expected to work on a broader range of machines out of the box. We also refined the driver with respect to the way it searches for networks. Prior to the change it was not possible to connect to a network with a hidden SSID. During the development of the Intel framebuffer driver, we encountered several DMA remapping faults caused by the IOMMU (Intel terminology: DMA remapping units). It turned out that the faults happened in a region, which the Intel GPU uses. Those regions get reported via an ACPI structure called "Reserved Memory Region Reporting Structure" (RMRR), which is defined by the documentation "Intel ® Virtualization Technology for Directed I/O Architecture Specification" in the chapter "BIOS Considerations". For PCI devices, the RMRR regions report information about physical ranges, which the device implicitly uses for DMA operations to work flawlessly. An operating system using the IOMMU feature must therefore take precautions to make such RMRR regions accessible for DMA operations of a specific PCI device. Our ACPI driver already detected such RMRR regions and printed the information. Until now, however, we had no need to actually make use of it. We extended our ACPI driver to propagate the RMRR region information via Genode's Report-ROM mechanism. The platform driver as the consumer of the report got extended to store the RMRR region information until a device driver for a specific PCI device gets started. As soon as the device driver gets assigned to the PCI device via the platform driver, the RMRR regions are added to the device PD of the driver. This enables the device to operate on the RMRR regions with DMA operations. In the context of our work on the USB Armory, we improved the robustness of our SD-card driver for the i.MX53 eSDHC. The new version has become able to deal with bogus transfer state information on multi-block writes, and copes well with the weak memory-ordering of ADMA-table accesses. Additionally, the driver was re-factored. A more detailed explanation and the background story are provided in Section Improved TrustZone support on USB Armory. The increasing interest in the combination of Genode and the Xilinx Zynq-7000 board motivated us to add official support to our custom kernel. The platform features a Cortex-A9 CPU. Thus, our existing kernel drivers for the Cortex-A9 private peripherals, namely the core-local timer and the ARM Generic Interrupt Controller, could be reused. The steps to enable the new platform included the creation of a new UART driver (UARTPS), the generalization of the PL310 L2-cache-controller driver, and the addition of board-specific declarations. Furthermore, support for the user-land timer driver was implemented using the Triple Timer Counter (TTC) on Zynq platforms. Although the board even supports SMP and a Xilinx FPGA, we don't make use of these features yet. However, the port is intended to serve as a starting point for further development in these directions. Thanks to Johannes Schlatow, Timo Wischer, and Mark Albers (TU Braunschweig, Germany) who contributed their work on Xilinx Zynq-7000! The x86 version of our custom kernel has been enhanced to evaluate the multiboot structure of the boot loader to detect all available physical memory. The core-physical allocator gets populated with this information enabling Genode to use all available memory instead of a preconfigured amount. And switching the on-board LED from within the monitor in order to signal trusted/untrusted code execution. The GPIO and clock controls are accessible by both the monitor and the guest. The guest OS cooperates by making no changes to the settings that would affect the monitor functionality. As a solution to this, guest access to the GPIO control should be para-virtualized. Please note, that one aspect of this is that the on-board LED is currently not trusted. Another consequence is the current lack of power management as the guest doesn't disable clocks in favour of Genode, and Genode, on the other hand, lacks support. The Genode driver for the USB-Armory eSDHC currently does not aim for maximum performance. The bus width and frequency are set statically to low values, aiming for broad support rather than getting the best out of each SD card. The on-board LED is currently switched on and off by the so-called TZ-VMM, a user-land component of the Genode system. For a more comprehensive indication of trusted execution, it would have to be controlled from within the Genode kernel. A tutorial on how to create a bootable SD card can be found in the corresponding run script os/tz_vmm.run. A tutorial on how to reproduce the pre-built Linux image, Rootfs and DTB - used by the run script - can be found at http://genode.org/files/release-15.11/usb_armory_tz_vmm/README. With the release 15.08, we extended the kernel to handle memory quota per Genode component. The line of work for the current release built upon those new mechanisms and simplifies the memory management within Genode's core component. In the original version of NOVA, all the memory used by user-level components had to be present in core's protection domain. This was needed to allow core to revoke the memory mappings from the components, e.g., when a dataspace is destructed or detached from the address space of a component. When revoking memory mappings core had to present evidence authorizing it to revoke those mappings to the kernel. Hence, the core-local mappings served as some kind of authorization token. Core would actually not use the core-local mappings except for the rare case of clearing a dataspace. Still, even though core was not expected to access the mapped memory that belongs to non-core components, it could still accidentally do so. For example, a dangling-pointer bug within core could read or overwrite memory in non-core components. The remote revoke extension of the kernel that we introduced in the previous release paved the ground to eventually remove core-local mappings for non-core memory. In the new version, core installs memory mappings directly into the user-level components. To revoke mappings, core specifies the PD selector of the targeted component and a component-virtual address range to the remote revoke operation of the kernel. This practice, which we also employ on our custom base-hw kernel, improves the fail-security of the system. In the unexpected case that something goes wrong within core (which should never happen, but still could), information between components can no longer accidentally cross address-space boundaries. iPXE is an open source network boot firmware, which supports booting from a web server via HTTP. This parameter specifies the base directory of the HTTP server, from which the target machine downloads the files. The directory which contains the iPXE chainload configuration and all necessary files given relative to the iPXE base directory. Note that the webserver serving the ISO image must support ranged requests. Thanks to Adrian-Ken Rueegsegger for these improvements! The development of the Codezero kernel came to a halt several years ago, its supported hardware platforms are outdated, and there is no active community of users. We still kept the platform on life by the means of nightly build tests and sporadic runtime tests. However, because each non-trivial change of kernel-dependent code required us to spend energy on the kernel to no apparent benefit, we finally dropped it. We originally introduced the so-called lx_hybrid base platform to ease the building of Genode completely with the Linux host tools and linked to the host libc. With this feature, we tried to accommodate the use of Genode as component middleware on top of regular Linux distributions. For quite some time, however, this feature remained unused. So we removed the lx_hybrid special case and the corresponding always_hybrid spec value.